Standing just 5-foot-1 and weighing little more than 100 pounds, you might think Kendall Coyne has trouble standing out in crowds. Fortunately for the braces-bound 15-year-old from the Chicago suburbs, her talent on the ice has set her apart from almost every crowd she’s ever been in. Case in point: Coyne was the only player from last summer’s USA Hockey Girls’ Select 15 Player Development Camp to be selected to participate in the Women’s National Festival in Lake Placid, N.Y., and play on the 2007 U.S. Women’s Under-18 Select Team for a three-game series with Canada. The youngest of 66 players in Lake Placid, she was among the scoring leaders at the festival while facing the likes of seasoned veterans such as Jenny Potter, who has won three Olympic medals as part of Team USA. From there, Coyne went on to Ottawa for the Under-18 Series, where she was two years younger than the majority of the players on the squad. Again, she impressed the Team USA coaches enough that she was designated as one of 22 players invited to try out for the 2008 U.S. Women’s National Under-18 Team that will play in the inaugural IIHF World Women’s Under-18 Championship Jan. 7-12 in Calgary. With the holiday camp concluding on Jan. 1, Coyne has proved herself to be a strong contender to represent her country at the world championship. Because she is one of 11 members back from the 2007 select team, Coyne knows she has a lot to live up to. Luckily for Coyne, she has a leg up on the rest when it comes to playing in Canada. When she was 11 years old, she played up a level on Team Powerade, a Girls’ 12 & Under team that traveled to Quebec City to play in a large boys’ tournament. 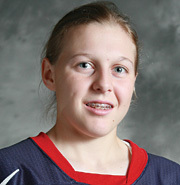 USA Hockey Experience: A member of the U.S. Women’s Under-18 Select Team and the U.S. Women’s National Under-18 Team. If she is able to help the U.S. team to the gold medal, she’d add it to the five state titles and one USA Hockey National Championship she already has under her belt in youth hockey, most of which came with boys’ teams. Just this past season, Coyne racked up a whopping 126 points in 63 games with the Chicago Mission Bantam Major team, an elite boys’ team based in Addison, Ill. Even when Coyne is taking a night off to watch one of her four siblings play hockey, she’s still looking for ways to improve. According to her mother, Ahlise, Kendall is always trying to get more ice time and find places to train to achieve her dreams of playing college hockey and for Team USA. That love, coupled with her young talent and work ethic, is bound to keep Coyne from ever going unnoticed, especially on the ice. Career Highlights: Keanna has been playing hockey since she was 5, and has been between the pipes since she was 6. For the second consecutive year, she was selected to play for two Minnesota all-star teams. She is currently playing for a Girls’ 12 & Under team in her hometown. Keanna’s dream is that one day there will be a women’s NHL.